ImageNet Büyük Ölçekli Görsel Tanıma Yarışması (ImageNet Large Scale Visual Recognition Challenge – ILSVRC) yüzlerce obje kategorisi ve milyonlarca resimden obje sınıflandırmaya yönelik yapılan bir faaliyettir. Yarışma 2010 yılından günümüze kadar yıllık olarak yapılmakta ve 50’nin üzerinde kuruluş tarafından katılım sağlanmaktadır. Yarışmaya katılmak isteyenleri eğitmeyi amaçlayan bir çalışma 7 Haziran 2015 tarihinde icra edilmiştir. Eğitim kapsamında icra edilen sunumlar aşağıda yer almaktadır. Machine learning is everywhere in today’s NLP, but by and large machine learning amounts to numerical optimization of weights for human designed representations and features. The goal of deep learning is to explore how computers can take advantage of data to develop features and representations appropriate for complex interpretation tasks. This tutorial aims to cover the basic motivation, ideas, models and learning algorithms in deep learning for natural language processing. Recently, these methods have been shown to perform very well on various NLP tasks such as language modeling, POS tagging, named entity recognition, sentiment analysis and paraphrase detection, among others. The most attractive quality of these techniques is that they can perform well without any external hand-designed resources or time-intensive feature engineering. Despite these advantages, many researchers in NLP are not familiar with these methods. Our focus is on insight and understanding, using graphical illustrations and simple, intuitive derivations. The goal of the tutorial is to make the inner workings of these techniques transparent, intuitive and their results interpretable, rather than black boxes labeled “magic here”. The first part of the tutorial presents the basics of neural networks, neural word vectors, several simple models based on local windows and the math and algorithms of training via backpropagation. In this section applications include language modeling and POS tagging. In the second section we present recursive neural networks which can learn structured tree outputs as well as vector representations for phrases and sentences. We cover both equations as well as applications. We show how training can be achieved by a modified version of the backpropagation algorithm introduced before. These modifications allow the algorithm to work on tree structures. Applications include sentiment analysis and paraphrase detection. We also draw connections to recent work in semantic compositionality in vector spaces. The principle goal, again, is to make these methods appear intuitive and interpretable rather than mathematically confusing. By this point in the tutorial, the audience members should have a clear understanding of how to build a deep learning system for word-, sentence- and document-level tasks. 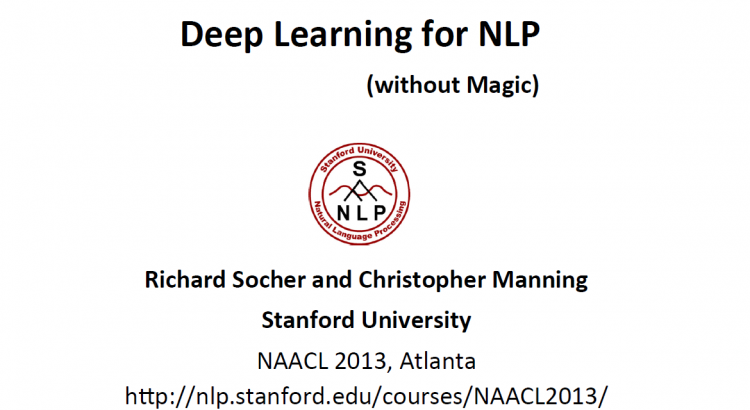 The last part of the tutorial gives a general overview of the different applications of deep learning in NLP, including bag of words models. We will provide a discussion of NLP-oriented issues in modeling, interpretation, representational power, and optimization.